It happened almost a decade ago, while Dr. Salome Maswime was doing her medical internship at a small hospital in rural South Africa. She was in a morning staff meeting when a junior doctor burst in, in a panic. A young woman in need of an emergency cesarean section had reacted badly to the epidural, or spinal anesthetic, the doctors had administered. The anesthesia had spread farther than it was meant to. The experience shook Maswime. And it stuck with her. Maswime, who is now a clinical researcher at the University of the Witwatersrand in Johannesburg, has dedicated her career to preventing maternal mortality. The first step, she says, is to better understand why and how mothers are dying. In a Lancet Global Health study published on Wednesday, she and her colleagues found that maternal deaths following a cesarean section are 50 times higher in African countries they looked at than in the U.K. — .5 percent compared to .01 percent. “What this highlights is the fragility of the health-care system across Africa,” Maswime says. Researchers looked at how more than 3,600 mothers in 22 African countries fared after having a C-section. Twenty women out of 3,684 died, and 1 in 6 developed complications like excessive bleeding during or after the surgery. About 10 percent of the deaths were associated with complications due to anesthesia — which most often was not administered by a skilled physician as recommended by global medical standards. And of 3506 infants born, 153 died soon after — a rate that’s twice the global neonatal mortality rate of 1.9 percent. This study makes clear that mothers are suffering from preventable or easily-solvable complications, says Dr. Bruce Biccard, an anesthesiologist and professor at the University of Cape Town who led the research. “The human resources — the staffing — required to care for mothers just isn’t there, across the continent,” he says. By contrast, in high-income countries like the U.S., women in labor would have access to a team of specialist surgeons, anesthesiologists and pediatricians (to attend to the newborn). Across Africa, many hospitals are understaffed. One generalist doctor might have to tend to several patients at once. “Another important finding is that about three-quarters of the women in the study had an emergency cesarean,” Biccard says. That’s likely because many women don’t get proper prenatal care — they don’t see gynecologists who are able to identify problems before delivery. Many of the women in the study had a high risk of complications due to pregnancy-induced high blood pressure called preeclampsia or a high risk of hemorrhage. “Some of these women might have fared better if they had come to the hospital earlier,” Biccard says, or had scheduled C-sections. In fact, only between 3 and 5 percent of African babies are born via cesarean. The global average is about 20 percent. In North America, the rate is almost 30 percent — which experts think is unnecessarily high. 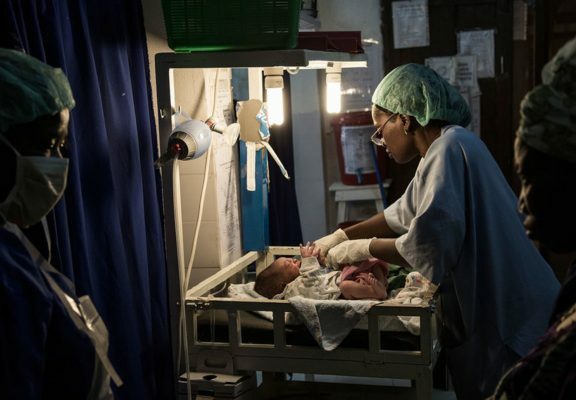 “While in high-income countries, we worry that the rate of cesareans is too high, in Africa, it’s the opposite,” says Kavita Singh Ongechi, an associate professor of maternal and child health at the UNC Carolina Population Center. A lot of African women who need C-sections aren’t getting them — and those who do get them aren’t receiving the best quality of care, she notes. Indeed, one limitation of the study is that it includes data from fewer than half of the countries in Africa. But at least in this case, Biccard says it may make sense to look at Africa as a whole. “When it comes to maternal mortality, the signal is consistent across the countries where we’ve worked,” he says. This study of C-sections tells only part of a much bigger, grimmer story of maternal mortality. The World Health Organization estimates that globally, about 830 women die each day from preventable pregnancy or childbirth-related complications; more than half of these deaths occur in sub-Saharan Africa. And yet, Langer adds, “as we say often, unfortunately, there aren’t any magic bullets.” What’s needed is more funding, more staffing, better training and equipment. “Increasing our resources twenty-fold all of a sudden just isn’t a viable solution,” says Biccard. For now, he’s working to develop techniques to help understaffed hospitals better assess and attend to the needs of pregnant mothers. Maswime has been touting “hemorrhage kits” for hospitals that contain the supplies necessary to treat the most common delivery complications.